Gaming Stock Profit System is a new automated trading software, which officially launched in February 2019. The software they are using is identical with other software we have seen recently. The only real difference between them, is the company logo and actors in the video. 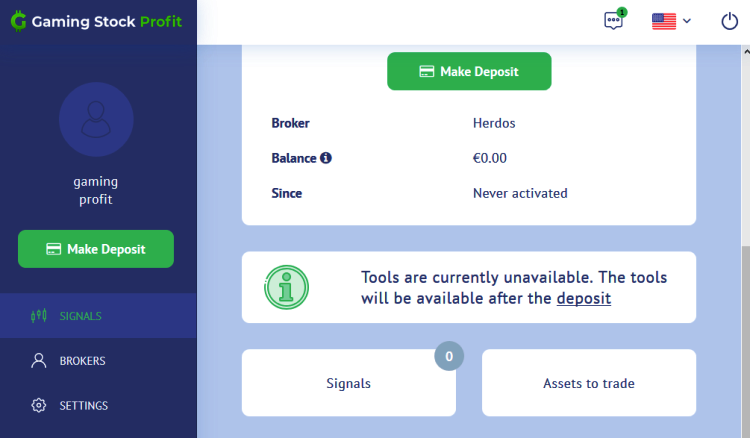 The Gaming Profit System’s trading software is integrated with a variety of offshore scam CFD stock brokers, and many of them are new, or they do not have a good reputation. This “revolutionary” algorithm software Gaming Profit System is not new or unique, and is very likely an investment scam. When we looked at the software options menu that you will be using, we saw right away, that you cannot control the robots profits. All the developers let you do, is turn it On/Off and enter the amount of money to want to lose for each trade. This tells us that Gaming Profit System is nothing more than another “get rich quick” Stock Trading scheme. Look at the screenshot we took of their trading dashboard, and compare it with a real trading robot, see here. Another reason why Gaming Stock’s Profit System a true pump and dump stock market scam, is their outrageous claims that you will make money, and it is free. A real EA or Algorithm Robo Advisor, only comes with warnings about your potential losses. Don’t worry, that will never happen! Brokerage fraud promoting investment in Forex, Crypto, Cannabis and now Gaming Shares, has been going on for many years. With this new release, there are no signs of it stopping anytime soon. Every government has issues warnings about unlicensed brokers, and there are still victims getting scammed daily. Interestingly enough, the only brokers who do not get complaints about them are the legal and licensed brokers, see here. Investing online is risky, and you can lose all your invested capital, and this is when using an ASIC regulated broker. However, if you are using an unlicensed stockbroker, you are almost guaranteed to never see your money again.